Molly Stillman is a writer, photographer, podcaster, and fashion blogger. Her lifestyle blog, Still Being Molly, exists to inspire women to walk joyfully and confidently in purpose, and to know that they were created with a purpose for a purpose. She is a leader in supporting fair trade companies, purchasing products – everything from clothing to home goods to bath and beauty – that are from ethical brands or sources. 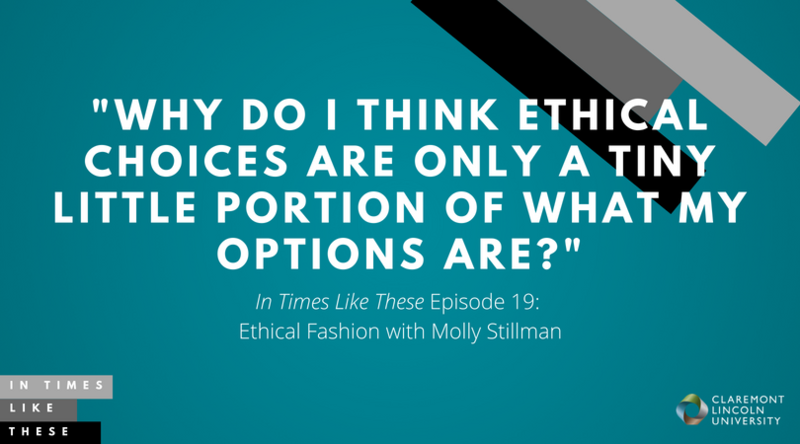 In the first part of our conversation, we talk ethical fashion with Molly Stillman, and how consumers are discovering a newfound hunger for purchasing goods that are created by workers who have access to humane conditions and a living wage. Then, we talk about her personal religious conviction, and how it has influenced everything she does. 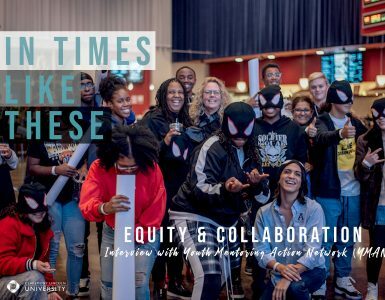 In this episode of In Times Like These, we explore the way our personal choices can impact communities for generations to come. Speaker 1: You’re listening to, “In Times Like These”, a production of CLU live at Claremont Lincoln University. “In Times Like These”, explores the difficult spaces we humans navigate in culture and religion, in dialogue and doubt. 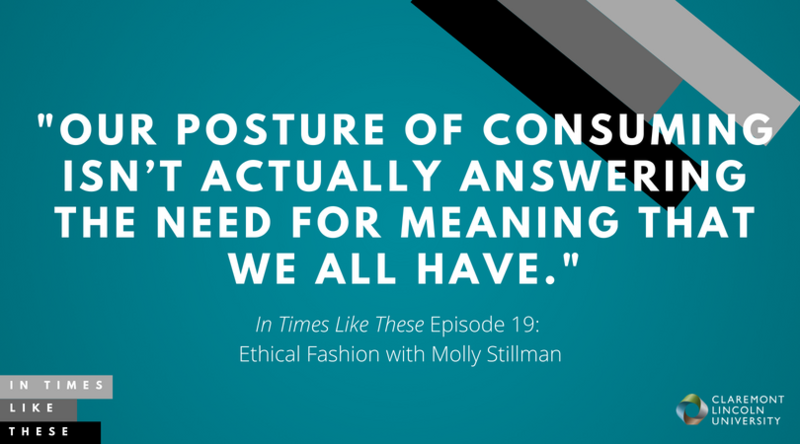 Molly Stillman is a writer, photographer, podcaster, and fashion blogger. Her lifestyle blog, “Still Being Molly”, exists to inspire women to walk joyfully and confidentially in purpose. She’s a leader in supporting fair trade companies, purchasing products. Everything from clothing to home goods, to bath and beauty, that are from ethical brands or sources. 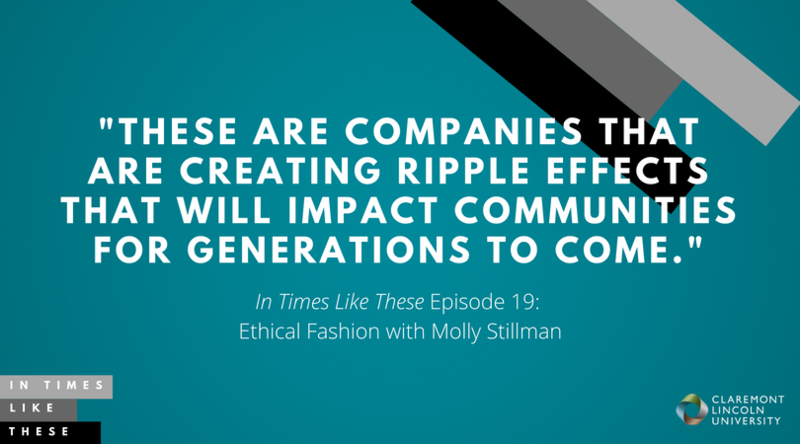 In the first part of our conversations, we talked ethical fashion and how consumers are discovering a newfound hunger for purchasing goods that are created by workers who have access to humane conditions and a living wage. Then, we talk about her personal religious conviction and how it has influenced everything she does. She is inspiring. All of us are seeking meaningful engagement and greater purpose. In this episode of “In Times Like These” we explore the way our personal choices can impact communities for generations to come. Speaker 2: Beautiful and cute and adorable and fashionable. When I first saw that you had a list … So I have a friend on Instagram and she was like “Oh, she took a break from buying anything for a year”. Speaker 2: Which is amazing, and then she came back on Instagram and said “Okay, I’m going to start slowly purchasing things. Does anyone have any good links to resources” and I thought “Oh, I’m gonna go to Molly’s page and get a few …” this is what I thought “A few links to share with my friend Karen”. Then I opened up part of your website. There aren’t just a few links. There are dozens and dozens and dozens and dozens of links. Speaker 2: So how is it that someone like myself who I think, you know I’m on Pinterest every day. I’m reading fashion magazines. Why do I think that ethical choices are like a tiny little percentage of what my options are? Molly Stillman: Yeah. That is a great question. First, thank you so much for having me. I am really excited to be here and it’s so nice to meet you. 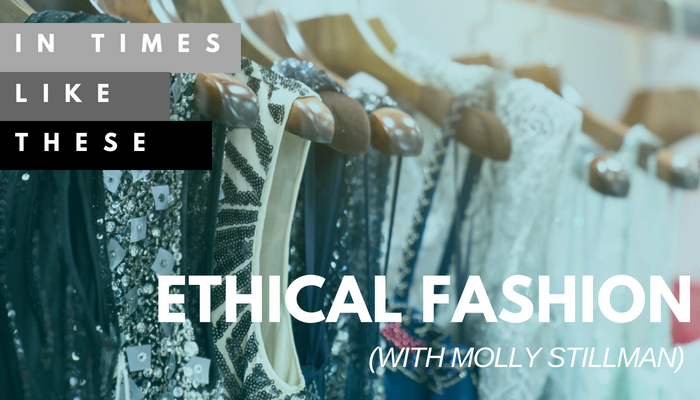 Yeah, that is a huge misconception that ethical fashion is not stylish, it’s not trendy. It’s inaccessible, it’s expensive, it’s hard to find. All these kind of things, and those are some of the myths that I love to bust and I love to tell people that no, that’s not the case. Ethical fashion can be extremely easy to find. Fair trade goods don’t have to be expensive and out of reach. It doesn’t have to be difficult. Yeah, I mean, and there are hundreds, hundreds, maybe even at this point, thousands of brands that are popping up that are paying their workers and their makers a living wage. They are working in developing nations. They’re working in communities here in the United States. They’re providing jobs and economic stability in so many communities. They’re really changing the world, and I say that sometimes and people say like “Oh, that seems like an exaggeration” and I’m like “no, these are companies that are having ripple effects that will affect communities for generations to come”. Molly Stillman: It’s huge. When a woman is investing that much money back into her community, whether that’s into education, helping other families, helping her own family, that has ripple effects that will literally change an entire community. When a community is changed, a region is changed. When a region is changed, a country is changed. I mean, it really does have global impact that changes lives. So when people say “Oh, that sounds like such an exaggeration that these companies are changing the world” I’m like “Nope. I’ve been there”. I’ve been to Kenya and I’ve seen the work that some of these groups are doing in Nairobi and Thika, Kenya and some of those surrounding communities. I’ve been to Costa Rica and I’ve seen artisan groups that are working in these incredibly remote areas, but are providing opportunity for thousands of people. Yeah, it is amazing and it is accessible. There are so many brands. You can buy everything from like toothbrushes to hair accessories to jewelry to clothing to kids and baby items to toys. I mean, pretty much name a product and you can buy it ethically. I mean there’s even like diamond wedding band companies that are making ethically sourced engagement and wedding rings. I mean, all those kinds of things. Yeah. I could talk about this stuff all day. Speaker 2: Well, and you know what, we should not be surprised that on the positive side, it can change communities because we have seen that fast fashion and cheap plastic has changed and devastated communities and ecosystems on the negative side, right? Speaker 2: So on the flip side, if we’re willing to work the other way, it should have the positive effect. Speaker 2: The long term effect. Molly Stillman: Yes. Absolutely. A documentary that I cannot recommend enough, I talk about it all the time, is a documentary called “The True Cost”. It’s available on Netflix. I think you can even go to thetruecost.com and stream it as well or you can purchase the streaming rights. If you have Netflix, it’s on Netflix. It’s about a 90 minute documentary, and I know that a lot of documentaries tend to like get debates because people are like “Oh, it’s only showing one side of things”. I have met people who have worked with the producers of “The True Cost”. It is, in my opinion, an incredibly accurate representation of what the fast fashion industry has done to communities and the globe and the environmental impact of fast fashion. Speaker 2: Right. When I might have two dresses, right? Speaker 2: Not that long ago, though, not that long ago. My great grandmother, right? Maybe not [inaudible 00:08:08]. Molly Stillman: So I mean, we’re talking, I mean definitely in the mid 1900’s into the ’70’s, maybe arguably the early ’80’s. The ’80’s is really when we start to see when that changed, but definitely into the ’90’s is when it really, really changed. Let’s talk pre-1980’s. There really used to be four seasons of fashion. Fall, winter, spring, and summer, and clothing brands would bring a new collection of their fall clothes, their winter clothes, their spring clothes, and their summer clothes. 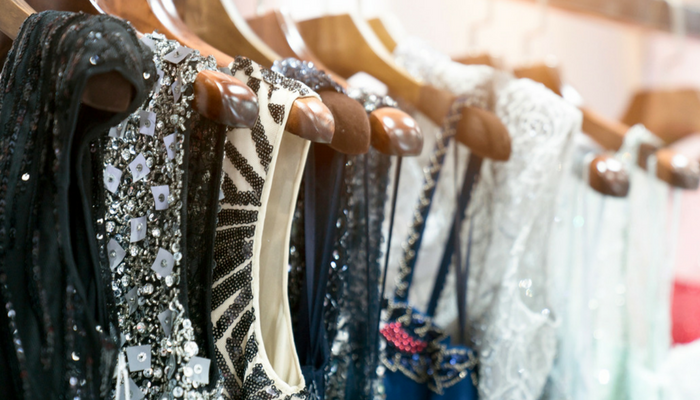 The average American woman owned maybe 30 to 40 pieces of clothing. That actually might be less depending on the community that you lived in. Basically, in the late ’80’s and into the ’90’s this demand for cheaper goods, when NAFTA happened and a lot of outsourcing happened and lot of production, manufacturing transitioned from the United States to overseas, ’cause prior to NAFTA we produced … The North American Free Trade Agreement. Prior to that, we produced about 90% of garments here in the United States. After that, it pretty much flipped and now about 90 to 95% of our garments are made overseas. So when that happened and we got access to cheaper labor, child labor, slave labor, that’s when like sweatshops became really more well known, that caused fashion brands to realize that they can make things for cheaper and they can come out with things more often, so that they can have a higher turnover and create more of the demand, you know supply and demand issue. Well then, eventually, there are now 52 seasons of clothing, so most of the fast fashion retailers you look at everything from Forever 21, H&M, Zara, those types of brands, they are literally coming out with new clothing every single week. So you see something on the runway at fashion week in the fall, and pretty much within a couple of weeks you’re gonna see it in the stores and at fashion retailers. When you think about what actually has to happen behind the scenes for that to happen, people will say like “Oh, I snagged this dress for $8.00, or I snagged this top for $6.99”. I’m like “You paid $6.99 for it, but somebody somewhere paid for that, whether that was through sacrificing time with their family, working in hazardous conditions”. I mean you name it, somebody somewhere paid for it. That shirt actually costs more than that to make it. Yeah, so that really is the definition of fast fashion, is just this creation of this demand for new, cheap things as much as possible. So we went pretty much from four seasons of fashion to 52. Speaker 2: Wow. I’m relating this … So I’m teaching a course in mindfulness right now and I just interviewed some people yesterday who do coaching, who coach athletes, high level athletes. They were talking in that interview about the fact that so many of their clients now have a demand for things to happen quickly. They wanna a 30 day fix. They want a 21 day fix. In mindfulness, my students are often talking about there’s this glorification of busy and more and consumery. We even see it in religious organizations. I’m church shopping. I like this about this synagogue with this about that synagogue. We’re in a consumer posture. Speaker 2: Yet, I’m hearing when I talk to folks like you and experts in lots of different realms; experts in mindfulness, experts in neuroscience, experts in fitness and health, that that posture of consuming isn’t actually answering a need for meaning that we have. What I’m thinking about when I hear you describing the true cost of things, is that even for the consumer, I can never have enough dresses. My closet will never be hip enough. I’m never gonna be sated. Speaker 2: If we can toggle away from gobbling up resources and think about what does it take to have meaning and purpose and happiness, that’s a larger societal shift. Molly Stillman: Absolutely. Absolutely. This is actually another thing that I talk about all the time is with … So really in the last I’d say definitely five years, I’d say probably five years, we have seen a huge shift in the food industry. When I was in college … So I graduated college 11 years ago. When I graduated college, I don’t think I honestly knew what organic was or non-GMO. I mean, that was just not a term that was talked about at all. Added sugars. I think the only thing that I knew about when it came to like healthy foods was … I had a roommate my junior year of college who told me to not buy anything with hydrogenated oils. That was like literally the only thing I knew, so I would like look at the ingredient list and see if it had hydrogenated oils and if it did, I wouldn’t buy it. I never thought to look for GMO’s or organic or I didn’t think to look for added sugars. Just none of that was something that was really talked about, and here we are 11 years later and people are talking about it all of the time. You see all of these restaurants popping up that are farm to table. There’s these produce boxes that you can get delivered to your doorstep. There’s more and more access to organic and natural foods. I mean, you have Wal-Mart who five years ago, you would never have seen an organic food item at a Wal-Mart and now organic you’ll drive down the highway and you see billboards for Wal-Mart talking about all the organic food that they carry. Molly Stillman: … issues, and so consumers started to demand better. And so here we are 11 years later. I mean, there’s not really a time but I’m just kind of thinking back in my head. Here we are, within the last five years. Molly Stillman: And that’s all anybody talks about, and it’s almost like oh, you don’t know where your meat comes from? I mean yeah, depending on where you live in the country, I mean there are some areas of the country were somebody would just be horrified to know that you have no idea where your meat comes from or that your seafood is not sustainably raised. I mean, things like that, people talk about all the time. My prediction is … So in 2013 is when the Rana Plaza complex disaster happened in Bangladesh. Molly Stillman: So this is the largest garment factory disaster I believe in history. Over 1,100 were killed, thousands more were injured. And this was a major, major garment factory complex in Bangladesh where I mean, Gap, Joe Fresh, Mango all of these big brands manufacture their clothes, workers had been telling their supervisors for months that the building was falling a part. There were garment workers that were found chained to sewing machines. All these kinds of things and so the building’s collapsed, people couldn’t get out. People were trapped for a long time, and that is what began what’s called the fashion revolution, and so fashion revolution is an actual organization. They’re based out of, I believe the UK but they’re a global organization that is really trying to get consumers to stand up and ask garment or ask companies and brands, who made my clothes? “I want to know farmers are being paid.” All these kinds of things, the food industry eventually had to wise up and say, “Okay, if consumers are demanding this, this is what we have to do.” Here we see with fashion, when consumers stand up and say, “I’m not gonna purchase from your company unless I know that you’re paying your garment workers a living wage, I’m not gonna purchase from your company if I know that you’re using harmful toxic chemicals in the cotton fields were your material’s being grown and farmers are being diagnosed with horrific diseases and cancers. I’m not going to purchase from your company if you’re having a harmful impact on the environment or if you’re using child or slave labor.” When consumers stand up, companies listen, and we’re starting to see that shift. I mean, a lot of big, big brand companies like Target actually in the last year or two has come out with an entire corporate, social responsibility plan. You could actually go on Target’s website and see their corporate, social responsibility plan and they have a whole entire goal that I want to say, please forgive me if I’m miss quoting this, but I want to say it’s by 2020, or 2022 they want to be working with WRAP, W-R-A-P certified factories. I can’t remember the exact … It’s World, I can’t remember what WRAP stands for, but WRAP certified are basically factories that are regularly audited, their workers are paid a living wage, their workers are in safe conditions, they have access to overtime pay. They have access to education and meals, all those kinds of things that are basic human needs. And so basic function of life. Yeah. They’re working to just be more sustainable as a company as a whole and so when you see a company like Target coming out with that, that sends a message to other big box retailers. So Target’s not perfect by any stretch of the imagination but they are much better than the alternative. Speaker 2: Right, and that’s an indicator of a cultural shift, because everyone I know shops at target, right? That’s a thing. A Target mom, they have a Starbucks there, they serve wine there. That’s part of our life. It’s not a boutique down in some fancy place in L.A., it’s Target. Yeah. Molly Stillman: Right. Right. And their re-imagining the design of their stores, I mean just all of those kinds things have an impact. And there are positives and negatives to that certainly, but in my opinion the more that a large company like that comes out and says, “We are not going to take advantage of the people that work for us, we’re not going to take advantage of the people who make our products.” That to me only sends a positive message, and it provides more accessibility. Molly Stillman: It’s happening. That’s a big deal. Molly Stillman: [crosstalk 00:21:41] never would have seen that five years ago. Speaker 2: It is a big deal. Yeah, and so now instead of bragging like, I know, I only got this for $2 dollars. I’ll be saying I know it’s from Target but it’s local wood. Speaker 2: Our [inaudible 00:21:54] is changing. Molly Stillman: Yes, and that’s the thing that I would love to see people start to brag more about. Speaker 2: I just got goosebumps. I literally just got goosebumps. Molly Stillman: … I bought it for $8.99. Speaker 2: Who do we want to be? Who do you want to be? Molly Stillman: Right. Right. Yeah so, it’s again, it’s not gonna happen over night, but mark my words, I really do believe that in the next 5 to 10 years we are going to see a massive shift in the fashion industry because again it’s also not sustainable, what we’re doing right now. Molly Stillman: The impact on the environment is simply not sustainable. Molly Stillman: So yeah. That’s a huge, huge issue but it’s something that I’m excited to see what happens. Speaker 2: Yeah. Being human is a messy endeavor. We are made to be in relationship and yet our fear of diversity keeps us a part. My new book explores this paralyzing paradox. Interfaith Grit; How Uncertainty Will Save Us is available now on Amazon and on my blog. It’s for all of us, ordinary readers seeking ways to learn how to engage with difference. Interfaith Grit is possible and it can save us. Okay I want to totally shift gears. Speaker 2: And I want to ask you because the first time I came to your website, so I knew who you were, I knew what you were doing and I came to your website and you mentioned Jesus right away. Speaker 2: And let me just tell you, okay so I’m just going to totally out myself here. Totally Christian, Jesus is in my heart, pray multiple times a day, important to my identity. Speaker 2: I have a degree in theology, went to seminary, the seminar I went to, very progressive. Chapel every day, no cross in the chapel, no Jesus. I mean, loving Jesus and talking about Jesus as someone I might have a relationship with is kind of seemed as deeply tacky in the circles I run, right? And that’s problematic and I’m getting older and wiser and I’m growing out of that. Speaker 2: But I think at least and a lot of progressive Christian circles and progressive interface circles, we want to talk about God and Jesus as if they are academic topics, but it’s seemed as somehow lower class or declasse, or like I’m dumb, right? To talk about prayer as if it’s meaningful. Speaker 2: So I just want to ask you, being so forthright about that. Help me be more of that. What’s going on? Molly Stillman: Yeah. Well, I mean to be honest, I did not grow up in a Christian home. My parents … It wasn’t that my parents were anti-church, that’s not it at all but both my parents grew up Irish Catholic, so they went to Catholic school. I mean both my parents were born in the ’40s and so their upbringing, they were each one of 5, my dad had 4 sisters, my mom had 4 sisters, they went to Catholic school, they were [crosstalk 00:25:14]. Molly Stillman: Oh yeah, it was just Catholicism was drilled into them at a very early age, and so when my parents met, they got married later in life, my mom had me when she was 39, and my dad was 41 when I was born. And so they just had a very different outlook on life, and they did not want to force, quote unquote, “force religion on me” which I see both sides. Molly Stillman: But I mean, in full disclosure, my husband and I, we’re both Christians and we’re raising our kids in a Christian home and I mean, at the end of the day, if my kids are kind and they love and serve Jesus, I will have done my job. Molly Stillman: Because I know the other side of it. As a Christ follower now, I know what it was like to not be a Christ follower. And so I kinda dabbled with church growing up, I went to mass on Christmas and Easter, ’cause that is what I thought you were supposed to do, and then I had a couple friends who were Christian so I kinda fell into a Christian quote unquote, “Christian circle” in middle school and I was a singer growing up and so I sang actually in a Christian worship band even though I wasn’t really a Christian, but I kinda was like, well yeah, this is what I’m supposed to do. Sure yeah. I sang in a Christian worship band called Doubting Thomas, it was the best Christian worship band name ever. Yeah, and then I really kind of fell out of that and my mom passed away when I was a senior in high school and we had just … I grew up in an extremely loving home but my childhood was not easy. Molly Stillman: Yeah, and so in a lot of ways here I was at home and I was dealing with the diagnosis of my mom and we didn’t really know what she had and all these kinds of things. So it was really difficult and then when she died, her death really affected me and the aftermath of it really affected me and I was angry at God. I was like, what is this God that people always talk about that’s so loving and all these kinds of things and so I walked away from him. Molly Stillman: And I went to college, and I just poured myself into academics and student activities and I was super involved in everything, and I worked my rear end off, and I had some friends who were Christian and would invite me to Christian things, and I would sometimes go to a bible study, but I don’t think I ever really … I would get tastes, which I know now were seeds being planted. That’s a very Christian term to say, but it really was. At the time it was seeds being planted in my life from Christ followers around me, but I wasn’t ready yet. And that’s really just the truth, I just wasn’t ready. And then after college, I fell into an extremely dark place. I even got to the point where I would openly say I don’t believe in Jesus, I mean I think he lived, but he was probably just a really great prophet, I would say things like that. So I went with him, and I remember walking in the doors of that church that day, and I felt really uncomfortable, but the faces of the people there were welcoming, and I saw people that looked different than from me. It wasn’t what I imagined church would be. I felt something different, which I now know really was just the Holy Spirit all over that church. But I felt something different and I haven’t missed a Sunday really since. That fall I really had to … I had a come to Jesus moment where I fell to my knees and was just like, “God, if you’re there, okay, I mean I’ve been trying to do this my way for my whole life. I’ve really screwed it up. So, I’m going to try it your way and see what happens.” I mean, I can only, from that moment on, it’s not like life got easy. In fact, life has certainly had its rocky moments. When God wrecks your life like that, I can’t not talk about Him. That’s honestly how it is. It’s one of those things where I have friends who are not believers. I have a lot of followers who are not believers. I have friends who are Muslim. I have friends who are Jewish. I have friends who are Bahá’í. I have friends of all religions. I will respect them, and I will listen to them, but I am not ashamed to say, “I’m a Christ follower. If you want to know more about Jesus, I’d love to talk to you about him.” But I’m never going to do it in a preachy or judgmental way because that’s not how He changed me. I’m only going to share what is my experience. I’m not going to ever make anyone else who doesn’t believe what I believe feel bad because that’s not what Jesus did. 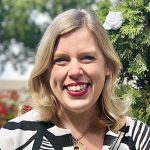 Molly Stillman: If you look at how … That’s what I think bothers me so much sometimes about Christians who just want to go to other people and say, “Oh, you’re doing this wrong,” or, “You’re doing this wrong,” or, “You don’t believe what I believe,” or yada yada, yada. I’m just like, “No, let’s go to the gospels, y’all. Let’s look at what Jesus actually did.” What did he do? He went and he hung out with the sinners. He did not call out their sin immediately. He met their needs and then they left and changed. Speaker 2: It was relationship. It was eating a meal. It was knowing someone. It was a friendship. Molly Stillman: Right. When you look at Zacchaeus, the tax collector. Every single person in his community hated him, made fun of him, refused to speak to him. Speaker 2: What did that do for him? Molly Stillman: It made him feel terrible. Then he suddenly, he saw the way Jesus treated other people. What did Jesus do? He invited him into his home. Molly Stillman: He had a meal with him. Everybody’s like, “What’s that Jesus doing with that tax collector? Why would Jesus … ” What did Zacchaeus do after that? He went and he paid back every single person he’d stolen from double. Did Jesus call out his sin? No. What he did was he loved him, he met his needs. Then Zacchaeus walked away changed. That’s how I was. Because Jesus … God never called out my sin to me. I called it out of myself. I already knew what I was doing. All I did was once I met Jesus, I went, “Okay,” and I walked away changed. You know I mean? Speaker 2: Oh, Molly, and you’re so generous. 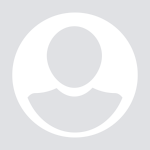 You’re being so generous [crosstalk 00:35:23] right now. I’m so fired up. I’m so inspired. I love that you said, “This is who I am. 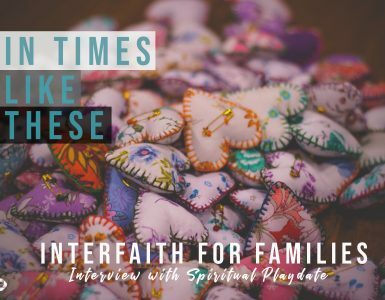 How can I teach, or work, or be in relationship, or be a good friend and leave this part out?” Actually, when we talk about interfaith work and interfaith studies and this new sort of phenomenon that’s happening, a lot of times in my experience, Christians are the most reluctant. They’re happy to learn about Ramadan. They want to be a good friend to their sick friends. But they’re almost timid. I’ve actually heard from my Muslim brothers and sisters, “I don’t want you to be less Christian. I don’t want you to be less Jesus. I want you to be your full self and then I can be my full self.” Because we’re not being authentic. It’s not authentic dialogue if we’re leaving part of ourselves behind. That’s what [crosstalk 00:36:19] illustrating. Molly Stillman: Yeah. I don’t remember exactly what scripture it is, but you know where Paul says, “I’m not ashamed of the Gospel.” That’s me, as like, “I’m not ashamed of it.” If somebody wants to make judgment, pass judgment on me based on the fact that I’m a Christian and I follow Jesus, then they’re welcome to do that. But I’m not going to pass judgment on them based on their beliefs. Christians, we’ve done it to ourselves. I think it’s Gandhi that said, “I like your Jesus, but I don’t like his followers.” Or, “I don’t like your Christians.” I’m paraphrasing, but and it’s true. The church has made some major mistakes over the years. We look back over the decades and the church has screwed up. But that’s not, God hasn’t screwed up. Jesus hasn’t screwed up, but his followers have. That’s ’cause we’re [crosstalk 00:37:13]. Speaker 2: Flawed, we’re broken. Molly Stillman: We’re sinful, flawed humans, yeah, for sure. But when the church is running on all cylinders … My pastor says this all the time. When the church is running on all cylinders, like there is nothing you can do to stop her. You look at natural disasters like what happened in Haiti, and hurricanes and things like that. Christian organizations made up 70-80% of the relief efforts because Christians know that it’s about being the hands and feet of Jesus and going when we are called to help. We can also be very hurtful. But when we’re being the Church. Speaker 2: Right, and that’s why we each, individually, have to be fully engaged, and present and committed because that’s what the community calls for. This is connected. Your personal ethic is connected to the work that you’re doing that has a social impact clearly, right? Molly Stillman: Oh, absolutely, absolutely. It’s all connected. It’s funny. For a couple years, I was not really sure how it all worked together ’cause I was like, “Well, I have this passion for fashion, and I love Jesus and I love beauty. I love serving people and I want to fight to end human trafficking. How do all these things fit together?” It’s amazing how in the last year or so, it’s just like, it’s like it’s clicked for me where it’s like these things all do work together. Speaker 2: Creative, beautiful, [crosstalk 00:39:16] life, yes, like waste it. Molly Stillman: Yes, He gave us these gifts for us to use for His glory. Maybe that sounds overly Christianese, but it’s true. I believe that people are given unique gifts, whether they can sing, or dance, or act, or paint, or write, or work with numbers, or help people, or work with their hands, or they’re a good builder, or whatever gift or talent you’ve been given. My husband loves spreadsheets and he creates spreadsheets in the name of Jesus. I don’t like spreadsheets. But God gave us these gifts to serve others and to build community and to bring Him glory ultimately. Speaker 2: … [inaudible 00:40:22] will flourish. 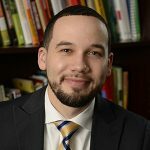 Our individual flourishing is connected to that community flourishing. Speaker 2: Not one or the other. It’s both. Speaker 2: This could be a course. 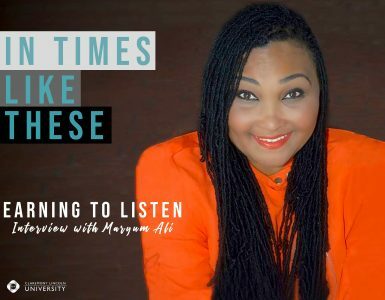 This conversation could lead to a course because you’ve given us resources, documentaries, organizations, legal and political concepts, individuals to look at and to follow, linked to the website, other podcasts, other conversations. If anyone’s listening and if they’re thinking, “Oh, what do I do next?” We have a series of places to continue to look and learn. I can’t tell you how excited I am to share this with our community and continue my own learning. Molly Stillman: Oh, thank you. Speaker 2: … so much, Molly. Molly Stillman: Oh, thank you. Seriously, it was my pleasure. It was truly an honor. Speaker 1: Thanks for listening to In Times Like These, where we explore issues of politics and faith and learn from one another how to navigate difference for maximum flourishing. In Times Like These is a product of CLU Live at Claremont Lincoln University. For more, subscribe, share and visit us at claremontlincoln.edu. We invite listeners interested in this topic to take a look at our master’s degree program in business ethics. It’s a huge misconception that ethical fashion is not stylish, not trendy, inaccessible, expensive, and hard to find. In recent years, we’ve made huge strides in shifting our consumption practices and valuing ethically sources and made fashion. The possibilities for purchase now run in the thousands. There’s no reason to wear fashion that harms other humans. Most makers in these brands are women. And when a woman has a job or economic opportunity in a developing country, she invests about 80-90% of her income back into that community. That’s more than a ripple effect—that’s income, job security, and access to health resources and education that can change the landscape of a community. Fast fashion and fast food exist for a reason: advertising and a consumer culture have us convinced that we’re not enough, and that we can buy things to fulfill us. And yet, these purchases often leave us dissatisfied, and in a continuous cycle to find meaning. It is possible to find meangingful engagement, and to build purposeful lives. But it takes a little curiosity and willingness to explore to figure out how. 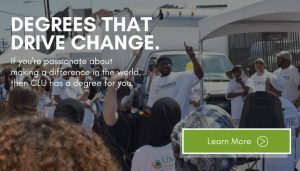 Claremont Lincoln University offers socially conscious master’s degree programs in organizational leadership, Public Policy human resources, healthcare administration, educational leadership, and social impact.